It's unexpected and different unless you're familiar with fruit carts in Latin America, but chili powder sprinkled on fruit makes for a pleasantly sweet-spicy combination. Use chili powder -- made only from dried, powdered chilis -- and not the spice mix used for bean or meat chili, which can contain cumin, garlic and other spices. 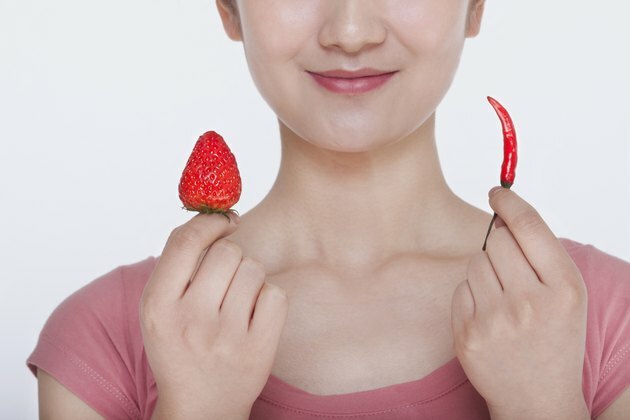 Chili powder on fruits increases flavor without adding sugar calories, and it can promote healthy weight loss. Chili powder contains capsaicin, the chemical compound that gives both fresh and dried chilis, such as cayenne, their spice and heat. In 2010, the "International Journal of Obesity" published findings that capsaicin, taken in tandem with caffeine, may increase fat oxidation and energy expenditure which could help counteract obesity. A 2003 issue of the "British Journal of Medicine" included a study that concluded that participants who took capsaicin for weight maintenance after losing weight had better fat oxidation than those who did not consume any capsaicin as part of their diet. Capsaicin did not help with reduced risk of weight gain after weight loss. Still, scientists found that capsaicin showed great promise, although further study is needed. Sprinkling white sugar or drizzling honey onto fruit makes it sweeter and, for some, better tasting. However, a diet high in added sugar, including honey, can contribute to weight gain. Added sugar has "empty" calories as it has no other nutrients -- vitamins, minerals, fiber -- and so does not contribute any health benefit. The American Heart Association recommends consuming no more than 100 to 150 calories' worth of added sugar a day. The natural sweetness of fruits offers a healthier alternative to sugar-sweetened foods. While chilis are part of the vegetable family group, a sprinkling of powder will not help you meet the daily vegetable intake recommended by the U.S. Department of Agriculture. However, chili powder on fruit can be the incentive you need to meet your recommended intake of fruits, which is 1 1/2 to 2 cups per day. In addition to helping you have a healthy and balanced diet, which is key to long-term weight loss, fruits are also high in dietary fiber. Fiber creates bulk in your diet, helping reduce your risk of overeating and leading to less chance of weight gain. You can change the type of chili powder you use to match the fruits you sprinkle it on and to adjust for your personal spice level. Cayenne powder is readily available in grocery stores, and the spicy flavor pairs well with very juicy fruits, such as watermelon and orange. Milder chili powders, such as ancho chili powder, can also be used to provide a slightly sweet, mildly spicy tingle to fruits. Traditional fruit plates in Mexico include a variety of fruits -- coconut, papaya, pineapple, cantaloupe and apple -- sprinkled with a mild chili powder. You can also try for more exotic chili powders, such as smoky chipotle chili powder, which pairs well with mango and pineapple.